Straight from the barrel to you: a velvety smooth brandy infused with dark chocolate. Herb Kohler, Executive Chairman, Kohler Co. believed the world deserved something better than a run-of-the-mill turtle. Chefs of The American Club® produced over 100 batches, and from this he discovered a Terrapin that met demanding requirements. In 2007 KOHLER Original Recipe Chocolates was born. In 2015, Mr. Kohler combined his love for Brandy with the definitive experience of KOHLER Original Recipe Chocolates and created Kohler Dark Chocolate Brandy. KOHLER Original Recipe Chocolates Dark Chocolate Brandy is best served neat, over ice or mixed into unique cocktail creations. by The Immigrant Restaurant of Destination Kohler in Kohler, WI. Muddle two Luxardo cherries, four dashes Angostura bitters, splash of water. 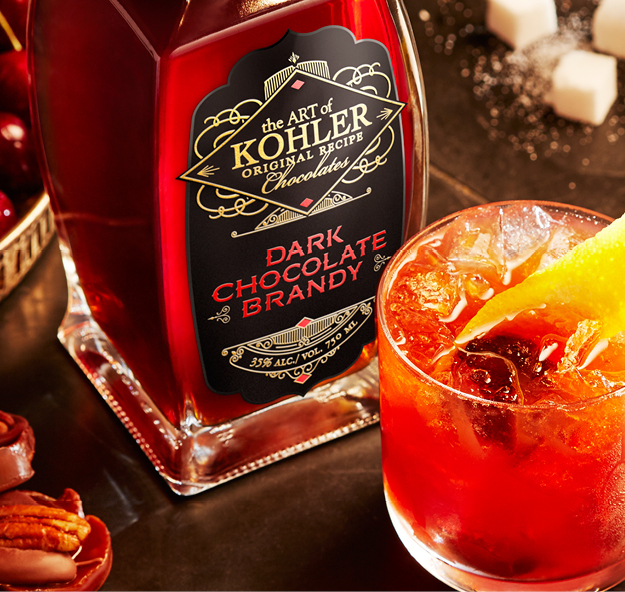 KOHLER Original Recipe Chocolates Dark Chocolate Brandy is available to enjoy and purchase throughout Wisconsin.